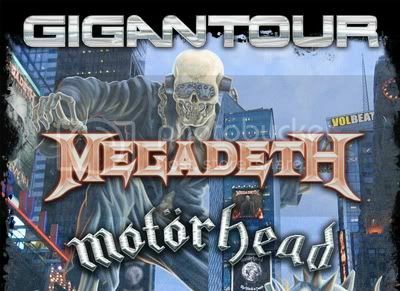 MEGADETH are relaunching for the first time since 2008, their critically acclaimed package festival, Gigantour. The multi-artist bill - with metal heavyweights MOTÖRHEAD, VOLBEAT and LACUNA COIL, all personally picked by Dave Mustaine - will kick off in early 2012 with dates tentatively set for late January through early March. Gigantour was founded by Mustaine in 2005 and was last in North America in May 2008. Gigantour is a chance to, as Mustaine says, tour with like-minded artists “that play heavy music in a high-energy environment,” with a fan-friendly ticket price. He founded the tour in 2005 and invited such artists as ANTHRAX, DREAM THEATER, FEAR FACTORY, LAMB OF GOD, OPETH, STATIC-X, and IN FLAMES to join Megadeth. For Lacuna Coil, Gigantour 2012 marks a return to the tour, as they performed on the 2007 Australian tour.